List of World’s Largest Buddha Statue. Here is the biggest Buddha statue and famous all over the world. Aside from being a worship sara has also become a tourist destination for travelers. Buddha statue weighs 300 tons and a height of 17 meters is the largest in India is derived from a large boulder carved and shaped into an outstanding masterpiece. It is also unusual because it was in the middle of an artificial lake that resembles an island. Hussain Sagar Buddha Statue which is located in Hyderabad city has become a magnet for tourists both local and foreign tourists. The statue is made of bronze is located in the town of kamakura Japan. In the local language is also called Duibitsu. Currently in addition to being a symbol of Japanese social life has also become quite a favorite tourist destination for travelers visiting this country. Super large-sized Buddha statue is the work of mankind involving thousands sculptor. The statue is carved in a valley in the western part of China’s precisely in this Suchuan facing directly out to sea. Its construction took 90 years starting from the year 713 AD to 803 AD during the Tang dynasty. Amazing charm often serve as inspiration in literary works such as poems, songs and stories. In the land of the rising sun of Japan in the city of Ushiku. 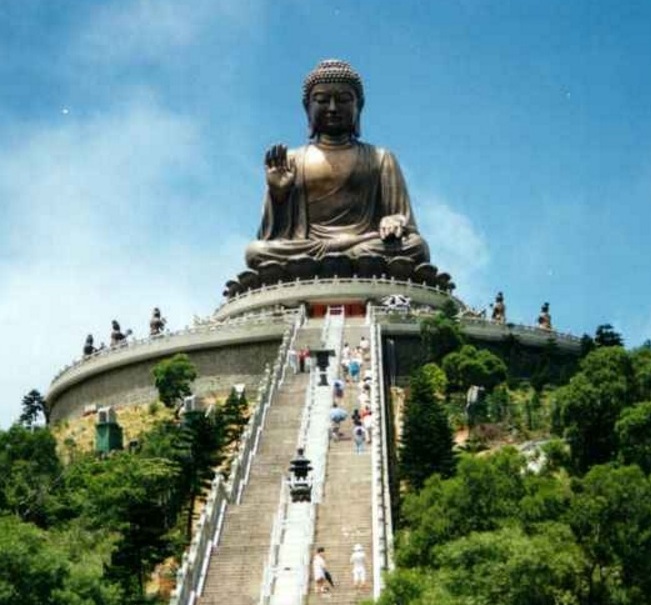 Is the tallest Buddha statue in the world with a height of 120 meters. The foundation has a height of 10 meters so is the lotus-shaped podium height reached 10 meters. Completed in 1995. The location is at the temple Wat Phra Kaew which is the most famous temple in Bangkok Thailand. The history of the Buddha statue is quite long. Manufacture in the city of Pataliputra India in the year 43 BC (BC) were there until the 4th century AD before being moved to Sri Lanka in order to avoid damage due to the war going until finally in 1779 put in Wat Phra Kaew. Being in Wat Pho in Bangkok Thailand. This statue is in a lying position. Built around 2 centuries after Bangkok became the capital of the country. The rock monastery is the work of Parakramabahu the Great in the 12th century AD located at Polonnaruwa, Sri Lanka. Inside there are 4 pieces of one of the Buddha statues in a lying position which has a length of 14 meters and standing as tall as 7 meters. Located on the banks of the Chindwin river is located in the town of Monywa Myanmar became the largest reclining Buddha statue in the world with a total length of nearly a football field is 90 meters. Created in 1991. Made of bronze was completed in 1993. It is located on Lantau Island, Hong Kong. Tian Tan has meaning paradise island has a height of 34 meters.